Thousands of delighted spectators, as from the Friday, were thrilled to go back in time and drool over the 330 competitors at the start of these Legend Boucles de Spa 2011, which once again were a fantastic overall success. Notwithstanding the lack of snow or ice the overall spectacle in no way disappointed all aficionados who loved being able to discern “with a sharp ear” the cars roaring away in the distance. Classic rallying, or historic rallying, is a type of road rally suitable for most standard classic cars, with no special equipment needed (the equipment allowed depends on the particular rally). These rallies are more about enjoyment than speed, and can be a good introduction to historic motor sports (which also include race meetings, classic endurance, and hillclimbing). A classic road rally is not about speed; in fact, there are severe penalties for finishing too early. The idea of a rally is to travel from a point to another within a certain time (time controls), not too fast or too slow, trying to match a speed average set by the organizers. Classic rallies will take you into the world of mythical rallies where you will experience the experience of great events of the 1960s and 1970s when man and machine were often alone for hours, even days, with little support. Cars now have expendable parts and a gearbox can be changed in twenty minutes. On the long tough rallies of yesteryear drivers had to drive 3000 km exclusively up and down the French Alpes, against the clock for most of the way, and look after the gearbox and every other part of the car, since changing them was out of the question. Liège-Sofia-Liège was even worse, being almost a flat out drive from Belgium to Bulgaria and back, through the roughest roads the length of Yugoslavia and over the horrific little passes like the Gavia and the Vivione in the Italy. Service was wherever the service crews could reach and was usually limited to a change of tires, refueling and, hopefully, minor repairs, since any time used for service had to be made up on the road by the driver. Both during the night and day the atmosphere was highly convivial, just like in the good old days. Overall the spectators remained highly disciplined and had full respect for heritage of the Clémentine grounds where it is therefore hoped that events can be held in the future. Not a single major incident was reported and the organisers did not have to cancel a single of the 15 Regularity Tests on the programme for the Legend competitors. On the other hand the dry weather had hardened the ground as such giving the older engines and transmissions a harder time which resulted in an unusual number of disasters amongst the major players, a mere 103 teams out of the 185 at the start of the Legend finishing this 53rd edition. Only too soon we lost the Porsches of Droogmans, Dumas, Van de Poele and Kelders, the Mazda of Henning Solberg, the Stratos of Perez and Loubet, the Ford of Munster, the Saab of de Spa, the Peugeot of Neuville, the Opel of Timmers, the Visa of Thiry not forgetting the Skoda of Freddy Loix who crashed over the barrier at Francorchamps. Up front the battle for victory opposed the Porsches of Patrick Snijers and François Duval from the Ford Escorts of Bjorn Waldegard and Stefaan Stouf. During the night the veteran Swede led until dropping back the rhythm somewhat at that time following an interphone breakdown. 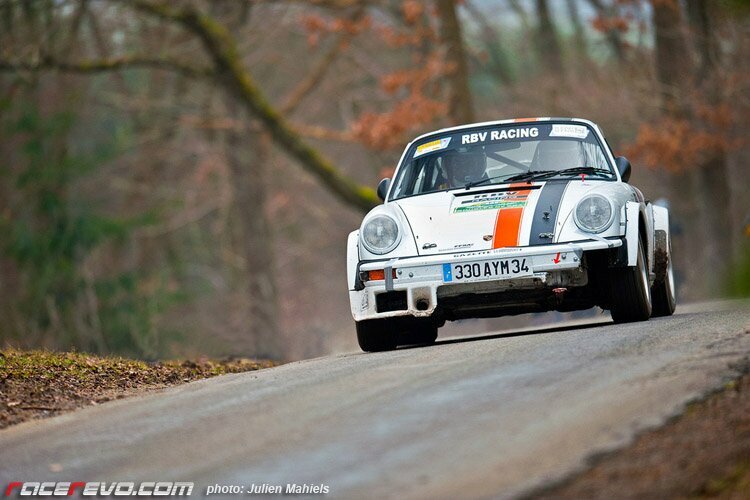 Highly at ease at the wheel of the 911 of 1972, François Duval had taken over the lead when an electrical problem stopped him short on the Saive military base section. His team mate Patrick Snijers, eight times winner, relayed him, but held back due to a broken alternator belt and two Asconas blocking his way on the first run through Creppe, the Unavenirquiroule.be driver finally had to be satisfied with the third tread of the podium. Exclusive - WRC Sardinia : "Atmosphere"
Great capture, thanks, wish could see some shots of the rally drivers too.